1. How to get ready to use the Skeleton Dress Up function? For this purpose, use the standard Autodesk Inventor 3D model creation functions. 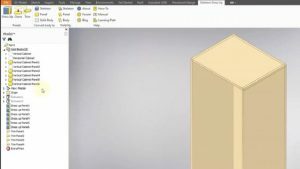 Create a general shape of the piece of furniture, which will be used as a basis for the bodies. The latter can be converted to parts. Bodies required to create parts of the necessary shape can be cloned or trimmed. All parts of the assembly are related to one skeleton part in terms of parameters. 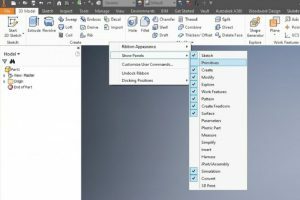 In the 3D Model toolbar, activate the Primitives option. This is done by clicking the right mouse button and selecting “Show Panels” – > “Primitives” in the opened dialog box. 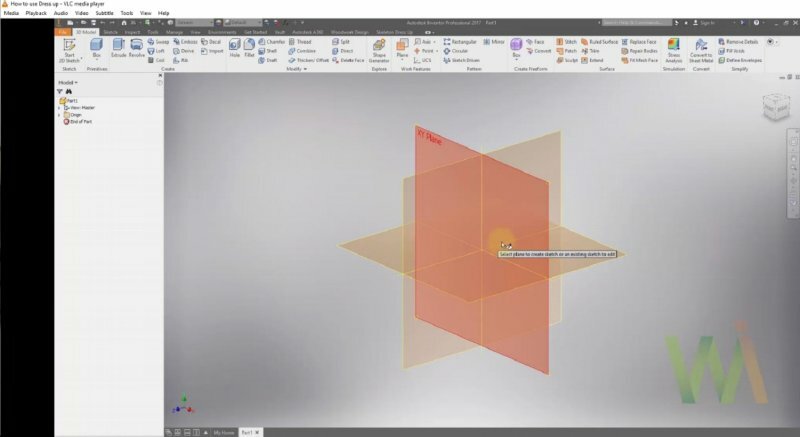 Select the “Start 2D Sketch” function to create the future model sketch on the XY plane. Set all necessary dimensions. 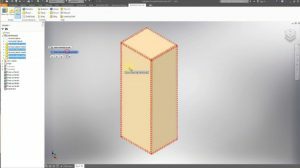 Use the “Extrude” function to create volume for the future cabinet. 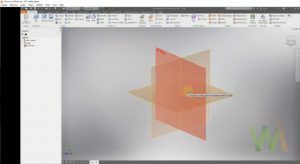 Use the “Rectangle” function to create the shape of the new body. 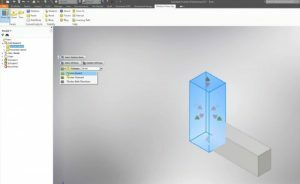 Set additional shape options. 2. HOW TO USE THE SKELETON DRESS UP FUNCTION? The Skeleton Dress Up function allows dressing up the body with furniture panels, selecting the direction (inward, outward or both ways) and setting panel thickness. 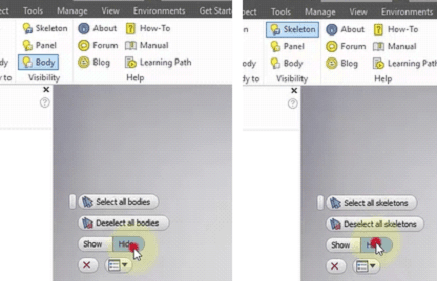 In the top menu bar, select the “Skeleton Dress Up” option. Then, in the skeleton body, select its surfaces to be covered with panels and click the “Dress Up” button. 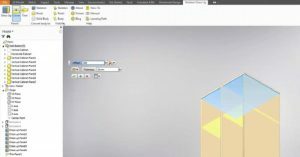 In the newly opened Skeleton Dress Up window, you can change the direction of thickening (inward, outward or both ways), and setting the thickening value. Surface names will be automatically assigned depending on the existing name of the skeleton body. 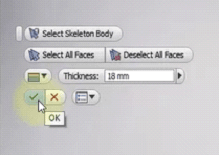 Once you have selected surfaces of the skeleton body to be covered with panels, click “OK” in the Skeleton Dress Up control panel. To ensure a more convenient workflow, we recommend turning off the visibility of bodies and skeletons that are not being used. 3. HOW TO TRIM THE PANELS? 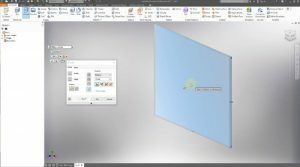 Click the “Trim” button and select all panels, which will be trimmed along the bounding panel or surface. In our case, it is necessary to select all panels, except the front panel, because it will be the intersecting one. 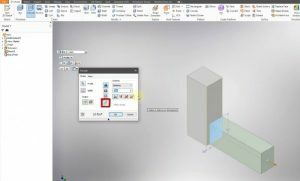 Then, in the control panel of the panel trimming command, click “Select Bounding Component” and select the intersecting panel. In this case, it is the front panel. Then, in the control panel of the Skeleton Dress Up command, click the “+” symbol. Close the control panel. 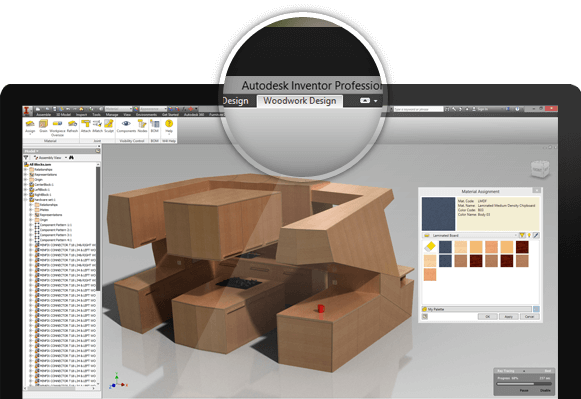 To continue the work, in the left menu window, turn off visibility of the intersecting panel. 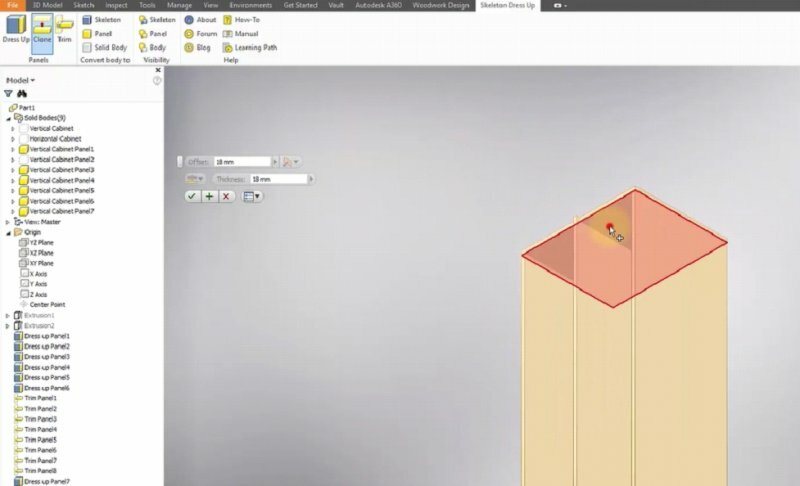 To learn more about other panel trimming options, watch full video. 4. HOW TO CLONE THE PANELS? 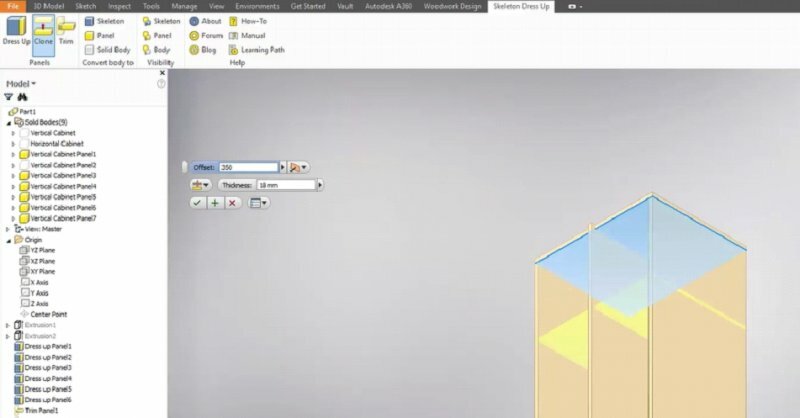 To create a new shelf, you can use the cloning function. Click the “Clone” button and select the panel to be cloned. In this case, we need to select the top panel. 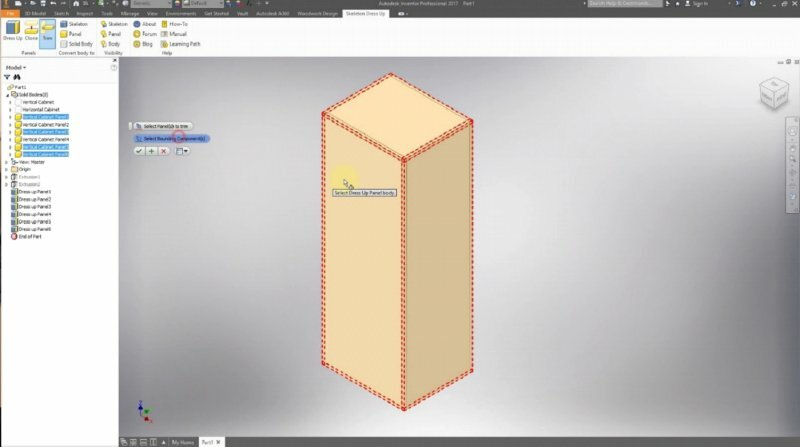 Now, use the “Offset” function and specify the distance of 350 mm; this will be the distance between the new shelf (clone) and the top (cloned) shelf. Use the cloning function to create a new shelf. Once this step has been completed, click the “OK” button in the cloning control panel. To learn more about other panel cloning options, watch full video. 5. HOW TO MOVE THE END FACE OF THE PANEL? In the toolbar, select “3D Model” option. 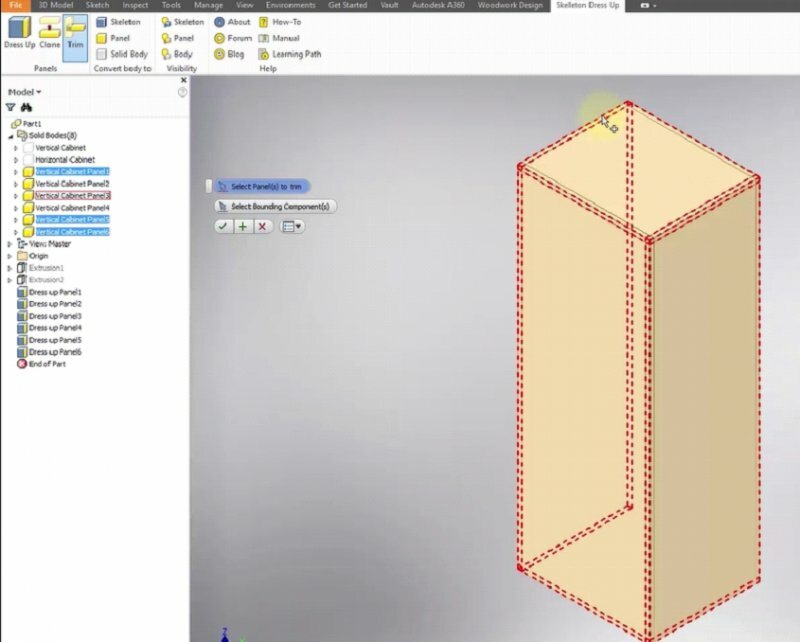 Then, click the “Direct” button and use the command to move side of the shelf by 10 mm. Repeat the step for all necessary surfaces. play_circle_filled 1. How to get ready to use the Skeleton Dress Up function? play_circle_filled 2. HOW TO USE THE SKELETON DRESS UP FUNCTION? play_circle_filled 3. HOW TO TRIM THE PANELS? play_circle_filled 4. HOW TO CLONE THE PANELS? play_circle_filled 5. HOW TO MOVE THE END FACE OF THE PANEL?